Ireland will be the team everyone will want a shot at when it comes to the forthcoming Six Nations Championship. The world number two Nation and current Grand Slam Champions will start the defence of the title on February 2 against Auld Enemy England in Dublin. Installed already as favourites to repeat their 2018 feat, captain Rory Best has warned doing a Grand Slam back-to-back is just as difficult as winning one. On Wednesday, Ireland head coach Joe Schmidt named a panel of 38 players for the opening two rounds of the Championship. And the man voted World coach of the year in November continues to look at development, included three uncapped Connacht men in his panel, Caolin Blade, Jack Carty and Tom Farrell. Ulster lock Iain Henderson, who underwent surgery on a thumb injury and was expected to miss the Championship has been included in the squad offering hope he will return sooner than later from his operation. 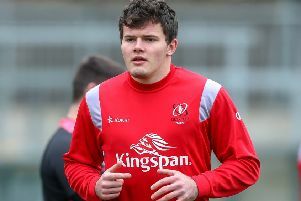 Although there are a number of players currently battling with injury, among them key playermaker and World player of the year, Johnny Sexton. Schmidt said the outhalf was making good progress in spite of missing defending European Champions Leinster’s game against Toulouse last weekend in Dublin and away to Wasps this weekend. The Irish squad will head to Portugal next week for a four-day training camp and Schmidt could be boosted further if all four Provinces secured places in the Champions and Challenge Cups in Europe after this weekend. Ireland skipper Best is fully focused on getting Ulster over the line in Pool Four when they meet Leicester Tigers at Welford Road, but in a recent interview with the News Letter admitted defending the Six Nations was going to be a tough challenge for the Irish. “It is incredibly difficult to get a Grand Slam and incredibly difficult to back it up because everyone wants to take a shot at you,” said Best. “That is utlimately like every other team going into the Six Nations, that is what we will be trying to do.